Finn Mackay is an Author, Academic and Feminist activist. She founded The London Feminist Network. Revived the London Reclaim the Night march, And a former organiser of the Feminism in London Conference. She was nominated as a world-changing woman in a 2006 Guardian poll. After working in youth work and education, Finn devised policy on domestic violence prevention before returning to academia and completing her PhD on the British Women’s Liberation Movement. She is currently a senior lecturer in sociology at the University of the West of England in Bristol. She speaks and writes regularly on Feminist issues, particularly male violence against women. 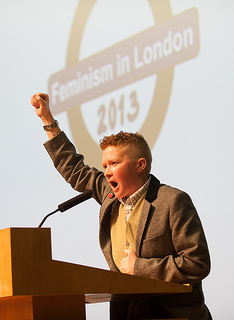 Posted in Uncategorized and tagged feminism, Feminism in London, feminist, Feminist Conference, FIL, FIL2015, Finn Mackay, Global Women Strike, organising, radio, women and anarchism. Bookmark the permalink.